Independent newly equipped studio apartment with lovely views overlooking the spa town and the Pyrenees with a balcony. The newly fitted separate kitchen/diner is fully equipped with fridge, ceramic hob, oven/grill, microwave, toaster, kettle and coffee machine. The comfortable centrally heated living area is fitted with a sofa, a double bed, ample storage in the wardrobe and drawer unit, free WIFI, TV/DVD and CD player. Books and games are provided and DVDs can be borrowed on request. There is garden furniture for the balcony and more seating in the garden near the BBQ. Allocated parking space and storage for sports equipment eg bikes or skis. All linen and towels are included in the rental price. The studio is suitable for couples with one child. No smoking inside the studio or pets allowed. Cot and highchair can be provided free of charge. Longer term rentals of up to 6 months considered. The studio has a shower room with basin and toilet. Towels and hairdryers are provided. There is storage for sport equipment such as skis or bikes. The studio has a balcony with garden furniture for taking meals outside. There is a barbeque and parking. The studio has gas central heating and an electric heater. Bagnères de Bigonne is a lovely, interesting town and the Haut Pyrenees region is wonderful. Spectacular scenery, small villages, lots to do in a small area. It's our first time in the area and we would certainly come back, possibly with the family. The accommodation was great and Dominique, the owner, is lovely and so helpful. She would love more people to come from the UK so that she can practise her English. Chaleureux accueil et logis impeccable! Dominique nous a très bien accueillis en nous décrivant les lieux et en nous fournissant plusieurs bonnes recommandations. Le logis était impeccable, confortable et très bien équipé. La ville est situé à quelques 15-20 minutes à pied. Deux boulangeries sont également accessible en moins de 10. On vous recommande vivement ce logis surtout si vous prévoyez parcourir les sentiers extraordinaires des Pyrénées. après un séjour dans cette location nous ne pouvons que dire bravo et merci a Mme Desprès pour l’accueil professionnel et chaleureux pour cette location. Ce studio et très fonctionnel et on s'y sent très vite bien. Sa proximité des commerces et restaurants nous ont permis de passer un bon séjour malgré le temps pluvieux mais çà personne ne pouvait le prévoir. Une adresse a conserver . Hemos pasado una semana muy agradable. El apartamento muy acogedor, en un entorno privilegiado. Los propietarios muy amables, se desviven por proporcionarte información de todos los lugares del entorno. Gracias por todo Dominique. Lo hemos pasado muy bien. Nous avons passé un très agréable séjour, le studio est bien agencé pour deux personnes.Les propriétaires sont disponibles et très discrets.La région est magnifique. studio très agréable, chaleureux et douillet. Nous avons pris en compte la remarque pour le compartiment Freezer et nous avons donc changer par un frigo avec un compartiment congélateur dés le début de l'été. Les personnes qui sont revenus cette année ont appréciées ce service. Nous sommes attentifs aux retours des locataires. Nous sommes dans une volonté d'échange et de convivialité. Merci pour ces retours encourageants. 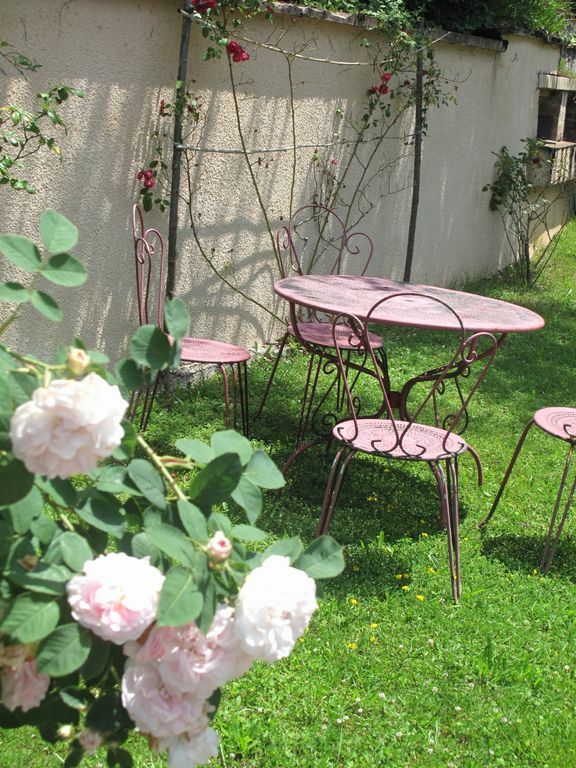 The Cottage, Grange & Studio apartment are set in the delightful town of Bagneres de Bigorre. A bustling spa town in the Haute-Pyrenees ideally placed for skiing at La Mongie and Payolle, visiting the Pyrenean National Park, Cirque du Gavarnie and Pic du Midi. Close to the sanctuary at Lourdes and easy drive of Pau and Toulouse. Visit Biarritz, Carcassone and Spain for days further afield. Watch the Tour de France which passes near by each year or cycle the cols yourself. There are many walks close by including the GR10 and the route of St Jacques de Compostelle passing close to our property. For golfers there is a 18 hole golf course with panoramic views of the Pyrenees is 2 km away with another 2 golf courses within easy reach. Other activities include canoeing, parapente, horse riding, mountain biking. If you prefer to relax there are the wonderful thermal spa baths in town and many good restaurants to try the wonderful regional dishes. Flights to Lourdes for the ski season. Other Activities: Canoeing, parapente, cross country skiing, casino. Golf: The golf course at Bagneres de Bigorre has spectacular views of the Pyrenees and is 2 km from our property. The 18 hole course is open all year and was designed by Olivier Brizon in 1991. Hiring of all golf equipment is available and golf lessons can be booked. Fees start at 30 euros for 18 holes. Also nearby are 18 hole golf courses at Tarbes and Lanemazan making Bagneres the ideal location to play at all 3 courses. Ski: La Mongie & Bareges, the largest ski resort in the French Pyrenees is 25 minutes away & suits all abilities whilst the more adventurous can ski off-piste from Pic du Midi. Some pistes run through beautiful forests whilst others have spectacular views of the Pyrenees. With 2 ski schools and most pistes easily accessed by chair lifts or teleski, it is a family orientated resort with ample restaurants and bars. The access road is good but snow chains or 4x4 are needed after heavy snowfall. A daily bus from Bagneres takes you to the resort & is free during French school holidays. Other ski resorts are within easy reach by car. Ski hire is available locally and we can store ski equipment. Why not try cross-country skiing or snow walking in the beautiful area of Payolle where you will find numerous tracks in pretty forests. This area is also great for watching the kids sledge from a warm bar. Also try dog sled rides or motoneige rides. Saturday flights from Stanstead to Lourdes in winter.